On Tuesday, the St. Louis Cardinals system went 2-4 with the GCL playoff game suspended and DSL Cards Blue eliminated. Outfielders Scott Hurst and Conner Capel are our Players of the Day with four RBI each for Palm Beach. Results from the games played Tuesday, August 28th. Division-winning Memphis (80-54) began its last road trip of the regular season with a 5-3 loss at Round Rock. Jake Woodford (L, 4-5) gave up all five tallies during his five-inning effort, yielding six hits and four walks. Giovanny Gallegos, Conner Greene and Andrew Morales each tossed a scoreless frame with Morales the only one to face the minimum. The Express’ shutout bid ended when Edmundo Sosa went yard in the seventh. The home run came with Wilfredo Tovar and Randy Arozarena aboard after the two reached on free passes. Sosa’s bomb was one of only four hits for the visitors. Playing at second base and leading off, Tommy Edman was hitless in three at bats but drew a walk in his return to Memphis. Michael Wacha’s rehab start was bumpy and abbreviated as Springfield (26-37) went on to lose to Arkansas in the first of their four-game home set. Making the first Double-A start of his rehab assignment, Wacha (L, 0-1) allowed single scores in his first two innings. The righty exited upon serving up a three-run home run and feeling slight abdominal tightness. Wacha permitted six hits and a base-on-balls in 2 1/3, a span in which it took 52 pitches to navigate. Two of the five tallies allowed were unearned. Round Rock continued its 12-hit attack against Wacha’s next two successors, Connor Jones and Elniery Garcia, who each gave up two runs in 2 1/3. Jones had difficulty finding the plate, issuing four free passes to go with two hits while Garcia permitted three hits and a walk. Landon Beck struck out three over the last two frames, allowing one hit. 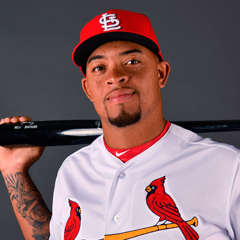 Springfield’s seven hits were distributed among six players, with Jose Martinez the only S-Card with more than one. The designated hitter singled twice in four at bats and knocked in two while batting ninth. Andrew Knizner’s only hit in four at bats was a solo bomb, his seventh Double-A long ball. Palm Beach (33-31) used a balanced offensive effort to drub Dunedin, 10-2, evening the away series at one game each with two to play. Four Beach Birds each had two of the team’s 11 hits: Conner Capel, Scott Hurst, Jose Godoy and Juan Yepez. Capel did considerable damage, doubling twice in five at bats with a run scored and four driven in to account for half of his squad’s tallies. The left fielder has hit safely in eight of his last 10 games, during which time he has a .282 average. Hurst took part in four runs, going 2-for-4 with a walk, double and three-run home run comprising three of his four RBI and the sole time the designated hitter crossed the plate. Godoy and Yepez both went 2-for-4 with a base-on-balls while touching home twice. Godoy doubled. Ian Oxnevad (W, 7-6) tossed five solid innings of two-run ball. The southpaw was touched for seven hits and a free pass with three strikeouts. Will Latcham recorded four outs and walked one. That base runner was left aboard by Jacob Patterson, who retired five while permitting a hit and base-on-balls. 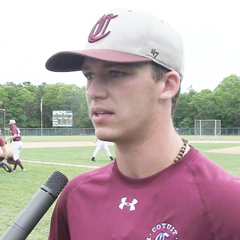 Bryan Dobzanski pitched a one-two-three ninth. Tuesday was the last regular season off day for the playoff-bound Chiefs, winners of the first-half Wild Card slot. Second-place Peoria (37-26) is still contending for the second-half division title, but is 3 ½ behind Cedar Rapids (MIN) with six games remaining, three at home and three on the road. The Spikes (34-36) mustered just four hits in their 8-1 road loss to the Muckdogs. The three-game series sweep by Batavia dealt a serious blow to State College’s slim hopes for postseason play, dropping them into a third-place tie with Batavia (34-36), 4 ½ in back of Mahoning Valley (CLE) with six regular season games to go. The Spikes would have to leap frog past seven teams to claim the Wild Card spot. The visitors’ only run was generated when Edwin Figuera tripled to begin the fourth and scored on Lars Nootbaar’s 6-3 groundout. It was Figuera’s only hit in four at bats. Nootbaar also went 1-for-4, doubling once with a strikeout. Defensively, third baseman Figuera committed a throwing error, his 16th miscue. Eli Kraus (L, 2-2) could not complete the third, surrendering two two-run home runs that were part of the six runs on five hits and three base-on-balls yielded in 2 1/3. 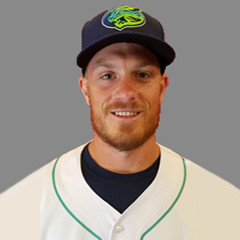 Cory Malcom allowed Kraus’ last two runners to score plus two of his own during his 2 2/3 innings on the bump, giving up four hits and a walk. Jim Voyles worked around a hit and two free passes for two clean frames. Kevin Hamann faced the minimum in the eighth, striking out two. A five-run fifth broke open a tight game, resulting in the Appy Birds’ 10-3 victory over the Mets. Johnson City (30-37) has won one of the series’ first two games with only the regular season finale remaining. Moises Castillo had a big night at the plate, going 3-for-4 with a walk, two-run long ball, three runs scored and two knocked in. Zach Jackson and Brian Sanchez both went 2-for-4 with a free pass. Jackson doubled, crossed home twice and drove in one while Sanchez scored a run. Kyle Leahy (W, 4-3) rebounded from a horrific effort against Burlington (KC) by tossing six impressive innings. The 21-year-old struck out eight while giving up two runs, one earned, on four hits and did not issue a free pass. Junior Gonzalez tossed two frames, permitting a run on two hits and a base-on-balls. Like Leahy, Gonzalez plunked one batter. Parker Kelly tiptoed around two hits and a free pass for a scoreless ninth. The second of the Gulf Birds’ best-of-three playoff semifinals versus the GCL Tigers West was suspended due to rain with two away in the home half of the fifth and the home team up 11-3. The GCL Cardinals (0-1) must win this contest in order to play the decisive third game, which would then take place after Game 2’s completion. Tuesday’s game was a tight see-saw battle through the initial four frames. The visitors broke on top with a first-inning tally off Brian Pirela but the Gulf Cardinals answered with a three-run third. That lead disappeared the next inning when Pirela allowed two more runs to knot the game at three all. The 20-year-old gave up seven hits through four, one of them a solo shot. 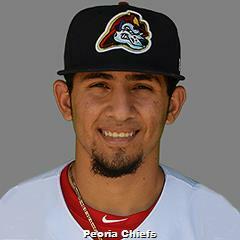 Freddy Pacheco permitted a fifth-inning hit. But the home team broke open the game with eight runs in just 2/3 of an inning. Seven Gulf Birds reached base before the visitors recorded an out and the first five Cardinals to reach drove the Tigers West’s starter from the game. The home team had runners at second and third with Ivan Herrera batting when play was suspended. The Cardinals’ 10 hits so far have been distributed among seven players. Josh Shaw, William Jimenez and Herrera have two hits apiece. Shaw doubled twice in three at bats with a run scored and four driven in. Jimenez has gone 2-for-2 with a triple, touched home twice and knocked in two while Herrera, the number two hitter, has singled twice in two at bats with two runs scored and an RBI. The DSL Cardinals Blue’s bid for the organization’s first-ever league championship title ended with a 9-8 loss to the Rangers1 in Game 2 of their best-of-three quarterfinal series. Including the last game of the regular season, this was the first time the Blue lost three consecutive games in 2018. Starter Inohan Paniagua took the loss after allowing five runs on seven hits and a walk in just 3 2/3. Victor Villanueva and Luis Tena both yielded a score while retiring four and five batters, respectively. 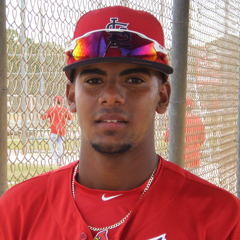 Leonardo Taveras was charged with two runs, one earned, on a hit and three walks during his 1 1/3-inning stint. Angel Ortega recorded two outs, stranding two inherited runners. A four-run eighth by the visitors made the game competitive but the C-Blue hitters were unable to translate any more of their 12 hits into tallies. Four players had two hits each: Darlin Moquete, Malcom Nunez, Jean Selmo and Sander Mora. Moquete accounted for three runs, singling twice in four at bats with a run scored and two RBI while Nunez went 2-for-3 with a base-on-balls and two knocked in. Selmo and Mora both singled twice and scored once but Mora was picked off and caught stealing.